Florance Jones - Queen 4pc sheet set: 1-flat sheet 92"w x 102"l, 1-fitted sheet 60"W x 80"L and 2-Standard Pillowcases 20"W x 30"L each. King 4pc sheet set: 1-flat sheet 110"w x 102"l, 1-fitted sheet 78"w x 80"L and 2-King Pillow Cases 20"W x 40"L each. California king 4pc sheet set: 1-flat sheet 110"w x 102"l, 1-fitted Sheet 72"W x 84"L and 2-King Pillowcases 20"W x 40"L each. Full 4pc sheet set: 1-flat sheet 80"w x 94"l, 1-fitted sheet 54"w x 75"L, and 2-Standard Pillow Cases 20"W x 30"L each. Florance jones hotel quality egyptian4 pc ultra soft bed sheet set with free 2 pillow cases | collection sheet set shsthr-122020809 | queen twin 3pc sheet set: 1-flat sheet 66"w x 96"l, 1-fitted sheet 39"w x 75"l and 1-standard pillowcase 20"w x 30"l twin extra long xl 3pc Sheet Set: 1-Flat Sheet 70"W x 102"L, 1-Fitted Sheet 39"W x 80"L 1-Standard Pillowcase 20"W x 30"L.
Florance Jones - Florance jones 6 piece paisley printed deep pocket bed sheet set - 5 beautiful colors available | collection sheet set shsthr-122022245 | queen twin 3pc sheet set: 1-flat sheet 66"w x 96"l, 1-fitted sheet 39"w x 75"l and 1-standard pillowcase 20"w x 30"l twin extra long xl 3pc Sheet Set: 1-Flat Sheet 70"W x 102"L, 1-Fitted Sheet 39"W x 80"L 1-Standard Pillowcase 20"W x 30"L.
Queen 4pc sheet set: 1-flat sheet 92"w x 102"l, 1-fitted sheet 60"W x 80"L and 2-Standard Pillowcases 20"W x 30"L each. California king 4pc sheet set: 1-flat sheet 110"w x 102"l, 1-fitted Sheet 72"W x 84"L and 2-King Pillowcases 20"W x 40"L each. Full 4pc sheet set: 1-flat sheet 80"w x 94"l, 1-fitted sheet 54"w x 75"L, and 2-Standard Pillow Cases 20"W x 30"L each. Florance Jones 6 Piece Paisley Printed Deep Pocket Bed Sheet Set - 5 Beautiful Colors Available | Collection Sheet Set SHSTHR-122022245 | Queen - King 4pc sheet set: 1-flat sheet 110"w x 102"l, 1-fitted sheet 78"w x 80"L and 2-King Pillow Cases 20"W x 40"L each. Florance Jones - Twin 3pc sheet set: 1-flat sheet 66"w x 96"l, 1-fitted sheet 39"w x 75"l and 1-standard pillowcase 20"w x 30"l twin extra long xl 3pc Sheet Set: 1-Flat Sheet 70"W x 102"L, 1-Fitted Sheet 39"W x 80"L 1-Standard Pillowcase 20"W x 30"L. Florance jones 6 piece paisley printed deep pocket bed sheet set - 5 beautiful colors available | collection sheet set shsthr-122022249 | queen twin 3pc sheet set: 1-flat sheet 66"w x 96"l, 1-fitted sheet 39"w x 75"l and 1-standard pillowcase 20"w x 30"l twin extra long xl 3pc Sheet Set: 1-Flat Sheet 70"W x 102"L, 1-Fitted Sheet 39"W x 80"L 1-Standard Pillowcase 20"W x 30"L.
Florance Jones 6 Piece Paisley Printed Deep Pocket Bed Sheet Set - 5 Beautiful Colors Available | Collection Sheet Set SHSTHR-122022249 | Queen - California king 4pc sheet set: 1-flat sheet 110"w x 102"l, 1-fitted Sheet 72"W x 84"L and 2-King Pillowcases 20"W x 40"L each. California king 4pc sheet set: 1-flat sheet 110"w x 102"l, 1-fitted Sheet 72"W x 84"L and 2-King Pillowcases 20"W x 40"L each. Full 4pc sheet set: 1-flat sheet 80"w x 94"l, 1-fitted sheet 54"w x 75"L, and 2-Standard Pillow Cases 20"W x 30"L each. King 4pc sheet set: 1-flat sheet 110"w x 102"l, 1-fitted sheet 78"w x 80"L and 2-King Pillow Cases 20"W x 40"L each. 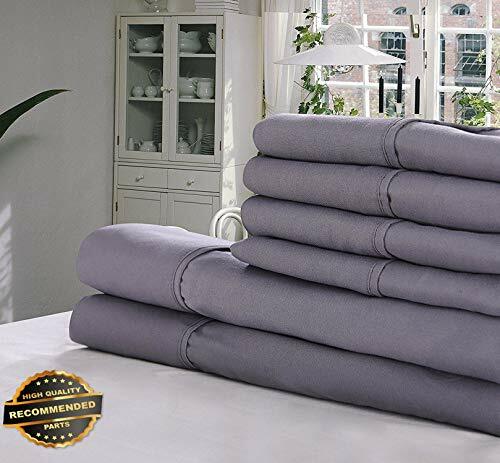 Queen 4pc sheet set: 1-flat sheet 92"w x 102"l, 1-fitted sheet 60"W x 80"L and 2-Standard Pillowcases 20"W x 30"L each.
. Full 4pc sheet set: 1-flat sheet 80"w x 94"l, 1-fitted sheet 54"w x 75"L, and 2-Standard Pillow Cases 20"W x 30"L each. Queen 4pc sheet set: 1-flat sheet 92"w x 102"l, 1-fitted sheet 60"W x 80"L and 2-Standard Pillowcases 20"W x 30"L each. Full 4pc sheet set: 1-flat sheet 80"w x 94"l, 1-fitted sheet 54"w x 75"L, and 2-Standard Pillow Cases 20"W x 30"L each. King 4pc sheet set: 1-flat sheet 110"w x 102"l, 1-fitted sheet 78"w x 80"L and 2-King Pillow Cases 20"W x 40"L each. Twin 3pc sheet set: 1-flat sheet 66"w x 96"l, 1-fitted sheet 39"w x 75"l and 1-standard pillowcase 20"w x 30"l twin extra long xl 3pc Sheet Set: 1-Flat Sheet 70"W x 102"L, 1-Fitted Sheet 39"W x 80"L 1-Standard Pillowcase 20"W x 30"L.
Florance Jones 6 Piece Paisley Printed Deep Pocket Bed Sheet Set - 5 Beautiful Colors Available | Collection Sheet Set SHSTHR-122022248 | Queen - California king 4pc sheet set: 1-flat sheet 110"w x 102"l, 1-fitted Sheet 72"W x 84"L and 2-King Pillowcases 20"W x 40"L each. Queen 4pc sheet set: 1-flat sheet 92"w x 102"l, 1-fitted sheet 60"W x 80"L and 2-Standard Pillowcases 20"W x 30"L each. California king 4pc sheet set: 1-flat sheet 110"w x 102"l, 1-fitted Sheet 72"W x 84"L and 2-King Pillowcases 20"W x 40"L each. Florance Jones - Florance jones 6 piece egyptian comfort 1800 thread count deep pocket bed sheet set - 12 colors | collection sheet set shsthr-122022112 | queen twin 3pc sheet set: 1-flat sheet 66"w x 96"l, 1-fitted sheet 39"w x 75"l and 1-standard pillowcase 20"w x 30"l twin extra long xl 3pc Sheet Set: 1-Flat Sheet 70"W x 102"L, 1-Fitted Sheet 39"W x 80"L 1-Standard Pillowcase 20"W x 30"L.
King 4pc sheet set: 1-flat sheet 110"w x 102"l, 1-fitted sheet 78"w x 80"L and 2-King Pillow Cases 20"W x 40"L each. California king 4pc sheet set: 1-flat sheet 110"w x 102"l, 1-fitted Sheet 72"W x 84"L and 2-King Pillowcases 20"W x 40"L each. California king 4pc sheet set: 1-flat sheet 110"w x 102"l, 1-fitted Sheet 72"W x 84"L and 2-King Pillowcases 20"W x 40"L each. Florance Jones 6 Piece Egyptian Comfort 1800 Thread Count Deep Pocket Bed Sheet Set - 12 Colors | Collection Sheet Set SHSTHR-122022112 | Queen - Full 4pc sheet set: 1-flat sheet 80"w x 94"l, 1-fitted sheet 54"w x 75"L, and 2-Standard Pillow Cases 20"W x 30"L each. King 4pc sheet set: 1-flat sheet 110"w x 102"l, 1-fitted sheet 78"w x 80"L and 2-King Pillow Cases 20"W x 40"L each. Queen 4pc sheet set: 1-flat sheet 92"w x 102"l, 1-fitted sheet 60"W x 80"L and 2-Standard Pillowcases 20"W x 30"L each. Florance Jones - California king 4pc sheet set: 1-flat sheet 110"w x 102"l, 1-fitted Sheet 72"W x 84"L and 2-King Pillowcases 20"W x 40"L each. Twin 3pc sheet set: 1-flat sheet 66"w x 96"l, 1-fitted sheet 39"w x 75"l and 1-standard pillowcase 20"w x 30"l twin extra long xl 3pc Sheet Set: 1-Flat Sheet 70"W x 102"L, 1-Fitted Sheet 39"W x 80"L 1-Standard Pillowcase 20"W x 30"L.
Full 4pc sheet set: 1-flat sheet 80"w x 94"l, 1-fitted sheet 54"w x 75"L, and 2-Standard Pillow Cases 20"W x 30"L each. King 4pc sheet set: 1-flat sheet 110"w x 102"l, 1-fitted sheet 78"w x 80"L and 2-King Pillow Cases 20"W x 40"L each. Twin 3pc sheet set: 1-flat sheet 66"w x 96"l, 1-fitted sheet 39"w x 75"l and 1-standard pillowcase 20"w x 30"l twin extra long xl 3pc Sheet Set: 1-Flat Sheet 70"W x 102"L, 1-Fitted Sheet 39"W x 80"L 1-Standard Pillowcase 20"W x 30"L.
King 4pc sheet set: 1-flat sheet 110"w x 102"l, 1-fitted sheet 78"w x 80"L and 2-King Pillow Cases 20"W x 40"L each. Full 4pc sheet set: 1-flat sheet 80"w x 94"l, 1-fitted sheet 54"w x 75"L, and 2-Standard Pillow Cases 20"W x 30"L each. Full 4pc sheet set: 1-flat sheet 80"w x 94"l, 1-fitted sheet 54"w x 75"L, and 2-Standard Pillow Cases 20"W x 30"L each. Florance Jones Egyptian 1800 Premium Quality Ultra Soft Striped Bed Sheet Set | Collection Sheet Set SHSTHR-122021473 | Queen - Full 4pc sheet set: 1-flat sheet 80"w x 94"l, 1-fitted sheet 54"w x 75"L, and 2-Standard Pillow Cases 20"W x 30"L each. California king 4pc sheet set: 1-flat sheet 110"w x 102"l, 1-fitted Sheet 72"W x 84"L and 2-King Pillowcases 20"W x 40"L each. Queen 4pc sheet set: 1-flat sheet 92"w x 102"l, 1-fitted sheet 60"W x 80"L and 2-Standard Pillowcases 20"W x 30"L each. Florance Jones - Full 4pc sheet set: 1-flat sheet 80"w x 94"l, 1-fitted sheet 54"w x 75"L, and 2-Standard Pillow Cases 20"W x 30"L each. California king 4pc sheet set: 1-flat sheet 110"w x 102"l, 1-fitted Sheet 72"W x 84"L and 2-King Pillowcases 20"W x 40"L each. Full 4pc sheet set: 1-flat sheet 80"w x 94"l, 1-fitted sheet 54"w x 75"L, and 2-Standard Pillow Cases 20"W x 30"L each. Full 4pc sheet set: 1-flat sheet 80"w x 94"l, 1-fitted sheet 54"w x 75"L, and 2-Standard Pillow Cases 20"W x 30"L each. Queen 4pc sheet set: 1-flat sheet 92"w x 102"l, 1-fitted sheet 60"W x 80"L and 2-Standard Pillowcases 20"W x 30"L each. Twin 3pc sheet set: 1-flat sheet 66"w x 96"l, 1-fitted sheet 39"w x 75"l and 1-standard pillowcase 20"w x 30"l twin extra long xl 3pc Sheet Set: 1-Flat Sheet 70"W x 102"L, 1-Fitted Sheet 39"W x 80"L 1-Standard Pillowcase 20"W x 30"L.
Florance Jones Bamboo 1800 DEEP Pocket Striped Bed Sheet Sets Hypoallergenic Soft Collection Sheet Set SHSTHR-122018271 | Queen - King 4pc sheet set: 1-flat sheet 110"w x 102"l, 1-fitted sheet 78"w x 80"L and 2-King Pillow Cases 20"W x 40"L each. Queen 4pc sheet set: 1-flat sheet 92"w x 102"l, 1-fitted sheet 60"W x 80"L and 2-Standard Pillowcases 20"W x 30"L each. Queen 4pc sheet set: 1-flat sheet 92"w x 102"l, 1-fitted sheet 60"W x 80"L and 2-Standard Pillowcases 20"W x 30"L each. Queen 4pc sheet set: 1-flat sheet 92"w x 102"l, 1-fitted sheet 60"W x 80"L and 2-Standard Pillowcases 20"W x 30"L each. Ectreme TTYEP034 - California king 4pc sheet set: 1-flat sheet 110"w x 102"l, 1-fitted Sheet 72"W x 84"L and 2-King Pillowcases 20"W x 40"L each. California king 4pc sheet set: 1-flat sheet 110"w x 102"l, 1-fitted Sheet 72"W x 84"L and 2-King Pillowcases 20"W x 40"L each. California king 4pc sheet set: 1-flat sheet 110"w x 102"l, 1-fitted Sheet 72"W x 84"L and 2-King Pillowcases 20"W x 40"L each. Full 4pc sheet set: 1-flat sheet 80"w x 94"l, 1-fitted sheet 54"w x 75"L, and 2-Standard Pillow Cases 20"W x 30"L each. Queen 4pc sheet set: 1-flat sheet 92"w x 102"l, 1-fitted sheet 60"W x 80"L and 2-Standard Pillowcases 20"W x 30"L each. Queen 4pc sheet set: 1-flat sheet 92"w x 102"l, 1-fitted sheet 60"W x 80"L and 2-Standard Pillowcases 20"W x 30"L each. Ectreme Android high Speed USB Universal Fast Charge Mobile Phone Data cable-T34 - Queen 4pc sheet set: 1-flat sheet 92"w x 102"l, 1-fitted sheet 60"W x 80"L and 2-Standard Pillowcases 20"W x 30"L each. Queen 4pc sheet set: 1-flat sheet 92"w x 102"l, 1-fitted sheet 60"W x 80"L and 2-Standard Pillowcases 20"W x 30"L each. California king 4pc sheet set: 1-flat sheet 110"w x 102"l, 1-fitted Sheet 72"W x 84"L and 2-King Pillowcases 20"W x 40"L each. Queen 4pc sheet set: 1-flat sheet 92"w x 102"l, 1-fitted sheet 60"W x 80"L and 2-Standard Pillowcases 20"W x 30"L each. King 4pc sheet set: 1-flat sheet 110"w x 102"l, 1-fitted sheet 78"w x 80"L and 2-King Pillow Cases 20"W x 40"L each. California king 4pc sheet set: 1-flat sheet 110"w x 102"l, 1-fitted Sheet 72"W x 84"L and 2-King Pillowcases 20"W x 40"L each. Twin 3pc sheet set: 1-flat sheet 66"w x 96"l, 1-fitted sheet 39"w x 75"l and 1-standard pillowcase 20"w x 30"l twin extra long xl 3pc Sheet Set: 1-Flat Sheet 70"W x 102"L, 1-Fitted Sheet 39"W x 80"L 1-Standard Pillowcase 20"W x 30"L.
Sandover - King 4pc sheet set: 1-flat sheet 110"w x 102"l, 1-fitted sheet 78"w x 80"L and 2-King Pillow Cases 20"W x 40"L each. California king 4pc sheet set: 1-flat sheet 110"w x 102"l, 1-fitted Sheet 72"W x 84"L and 2-King Pillowcases 20"W x 40"L each. Twin 3pc sheet set: 1-flat sheet 66"w x 96"l, 1-fitted sheet 39"w x 75"l and 1-standard pillowcase 20"w x 30"l twin extra long xl 3pc Sheet Set: 1-Flat Sheet 70"W x 102"L, 1-Fitted Sheet 39"W x 80"L 1-Standard Pillowcase 20"W x 30"L.
Sandover Egyptian Comfort 2100 Count 4 Piece Deep Pocket Bed Sheet Set Wrinkle Free USA| Size King | Style DUV-5301218201 - Twin 3pc sheet set: 1-flat sheet 66"w x 96"l, 1-fitted sheet 39"w x 75"l and 1-standard pillowcase 20"w x 30"l twin extra long xl 3pc Sheet Set: 1-Flat Sheet 70"W x 102"L, 1-Fitted Sheet 39"W x 80"L 1-Standard Pillowcase 20"W x 30"L. King 4pc sheet set: 1-flat sheet 110"w x 102"l, 1-fitted sheet 78"w x 80"L and 2-King Pillow Cases 20"W x 40"L each. Florance Jones - Queen 4pc sheet set: 1-flat sheet 92"w x 102"l, 1-fitted sheet 60"W x 80"L and 2-Standard Pillowcases 20"W x 30"L each. California king 4pc sheet set: 1-flat sheet 110"w x 102"l, 1-fitted Sheet 72"W x 84"L and 2-King Pillowcases 20"W x 40"L each. California king 4pc sheet set: 1-flat sheet 110"w x 102"l, 1-fitted Sheet 72"W x 84"L and 2-King Pillowcases 20"W x 40"L each. Full 4pc sheet set: 1-flat sheet 80"w x 94"l, 1-fitted sheet 54"w x 75"L, and 2-Standard Pillow Cases 20"W x 30"L each. King 4pc sheet set: 1-flat sheet 110"w x 102"l, 1-fitted sheet 78"w x 80"L and 2-King Pillow Cases 20"W x 40"L each. Full 4pc sheet set: 1-flat sheet 80"w x 94"l, 1-fitted sheet 54"w x 75"L, and 2-Standard Pillow Cases 20"W x 30"L each. Florance Jones 4 Pieces Bed Sheet Set 1800 Series Deep Pocket Egyptian Comfort Multiple Colors | Collection Sheet Set SHSTHR-122020998 | Queen - King 4pc sheet set: 1-flat sheet 110"w x 102"l, 1-fitted sheet 78"w x 80"L and 2-King Pillow Cases 20"W x 40"L each. California king 4pc sheet set: 1-flat sheet 110"w x 102"l, 1-fitted Sheet 72"W x 84"L and 2-King Pillowcases 20"W x 40"L each. Twin 3pc sheet set: 1-flat sheet 66"w x 96"l, 1-fitted sheet 39"w x 75"l and 1-standard pillowcase 20"w x 30"l twin extra long xl 3pc Sheet Set: 1-Flat Sheet 70"W x 102"L, 1-Fitted Sheet 39"W x 80"L 1-Standard Pillowcase 20"W x 30"L.
California king 4pc sheet set: 1-flat sheet 110"w x 102"l, 1-fitted Sheet 72"W x 84"L and 2-King Pillowcases 20"W x 40"L each. Queen 4pc sheet set: 1-flat sheet 92"w x 102"l, 1-fitted sheet 60"W x 80"L and 2-Standard Pillowcases 20"W x 30"L each. California king 4pc sheet set: 1-flat sheet 110"w x 102"l, 1-fitted Sheet 72"W x 84"L and 2-King Pillowcases 20"W x 40"L each. 5 Beautiful Colors Available | Collection Sheet Set SHSTHR-122022247 | Queen - Florance Jones 6 Piece Paisley Printed Deep Pocket Bed Sheet Set - Full 4pc sheet set: 1-flat sheet 80"w x 94"l, 1-fitted sheet 54"w x 75"L, and 2-Standard Pillow Cases 20"W x 30"L each. Full 4pc sheet set: 1-flat sheet 80"w x 94"l, 1-fitted sheet 54"w x 75"L, and 2-Standard Pillow Cases 20"W x 30"L each. Bold tpe wire, resistant to bending and bending, continuous line. Get the most out of your performance and ensure that charging and data transfer take place simultaneously. Guaranteed transmission efficiency, easy to carry around, to meet daily use. Save time by allowing current to flow more stably. Queen 4pc sheet set: 1-flat sheet 92"w x 102"l, 1-fitted sheet 60"W x 80"L and 2-Standard Pillowcases 20"W x 30"L each.